Women's Knee-Hi Prairie Style Boots. Cow suede upper and fully leather lining, lightweight rubber outsole and padded insole. 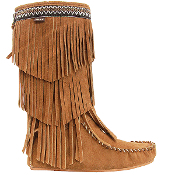 Fully covered with 3-Tier suede fringe. Rear-Zip closure for easy put-on and comfort. Made with soft, strong and supple suede. Street and outdoor-adventure use.